12", Wood, Hand Screw Clamp, Large Diameter Spindles For Added Strength & Durability, Spindles & Swivel Nuts Are Made From Cold Drawn, Carbon Steel, Acme Thread For Rapid Operation & Years Of Hard Use, Hardwood Handles Are Over-Sized For Comfort, Extra Torque & Reinforced With Steel Ferrules, The Spiral Pin Used To Secure The Handles To The Spindle Is Easy To Remove For Repair Or Replacement, Metal Parts Are Treated To Resist Rust, Jaws Made From Quality Hard Maple For A Lifetime Of Use Are Oiled To Resist Glue, 12" Jaw Length, 9-1/4" Clamping Capacity, 6" Throat Depth, .44 Spindle Diameter. Feature a large diameter spindles for added strength and durability. Spindles and swivel nuts are made from cold drawn, carbon steel. Acme thread for rapid operation and years of hard use. Hardwood handles are over-sized for comfort, extra torque and reinforced with steel ferrules. The spiral pin used to secure the handles to the spindle is easy to remove for repair or replacement. Metal parts are treated to resist rust. The jaws, made from quality hard maple for a lifetime of use, are oiled to resist glue. This wood hand screw clamp is just the clamp you need for gluing. Large handles for comfort and torque. Adjustable jaws for a strong grip or delicate for those small projects. 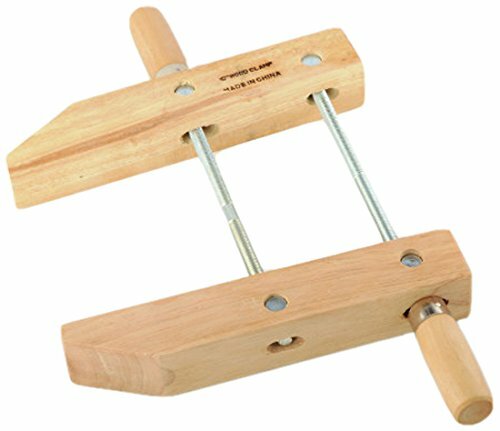 6", Wood, Hand Screw Clamp, Adjustable Jaws For A Strong Grip Or Delicate For Those Small Projects, Oiled Wooden Jaws Won't Damage Or Slip On Your Work Piece, Held Together By Cold-Drawn, Carbon-Steel Spindles & Swivel Nuts, Acme Thread For Quick Clamping, Metal Parts Are Treated To Resist Rust, Large Handles For Comfort & Torque, 6" Jaw Length, 3" Clamping Capacity, 3" Throat Depth,.37 Spindle Diameter. "Designed as key system components to the Festool MFT and Guide Rail systems, Festool Screw Clamps secure your workpiece for precision cutting, sanding, routing, sanding, or just about any other application. Designed to work seamlessly with holes and channels on the Festool MFT Multifunction Table and can be inserted into bottom t-slot of Festool FS Guide Rails for limitless positioning. Features Clamping thickness 4 11/16 inches (120 mm). Traditional screw clamp design with specialized head made to fit the holes and channels of the MFT and Guide Rail systems. Secure your workpiece for precision cutting, sanding, routing, sanding, or just about any other application. 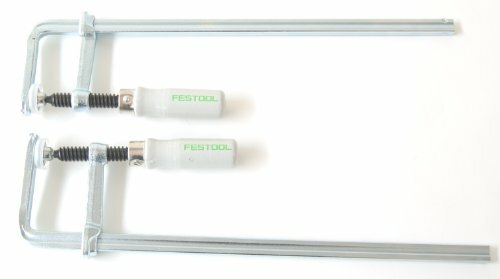 Designed for all clamping applications across the Festool SystemClamping width: 4-3/4"" Solid steel versionIncludes2 pk. of Screw ClampsPlease note: due to the high incident of fraudulent transactions with orders containing name brand products, orders for this item must ship to the billing address." 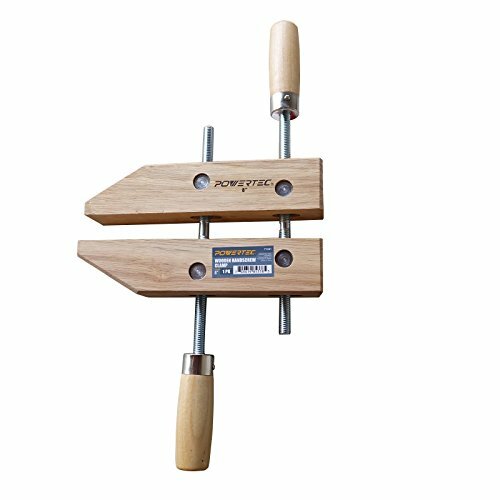 The POWERTEC wooden clamps deliver a reliable, firm grip that locks your workpieces in a desired position. 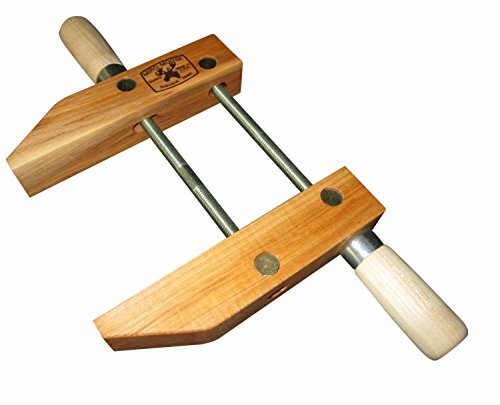 These classic hardwood accessories prevent workpiece slide and movement, thereby improving both critical user safety and enhanced woodworking accuracy. And they're rugged enough for hard stock but gentle enough for more delicate work material. Acme-thread technology feature makes clamping action Quick, easy and ultra-secure. Generous, large ergonomic handles insure the utmost in comfort, control and optimal clamping leverage. You can't go wrong with these versatile, must-have tools. Constructed of superior materials, these clamps are built for the ultimate in durability and efficacy. The clamp resists glue and won't Mar your work stock. The Spindle, swivel nuts, caps and hardware offer the ultimate in rust-resistance, dependability and stock-holding security. With their 8-inch jaw length, 4-inch clamping capacity and 4-inch throat, these devices adjust to accommodate to most stock size. These POWERTEC wooden clamps are essential for any professional or home workshop. Maximize outcomes and minimize hassle with these timeless Classics. We make the tools to support your creativity and productivity, so you can get the job done to perfection. 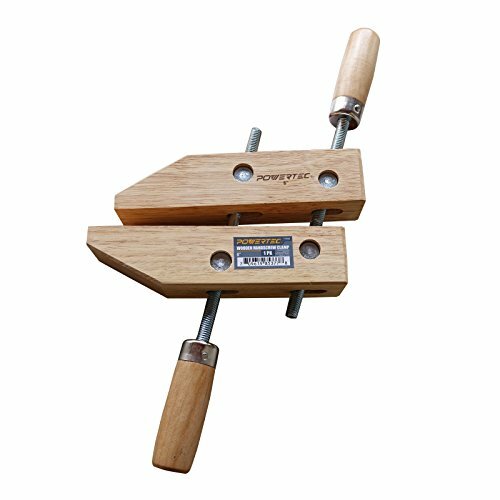 The POWERTEC wooden clamps deliver a reliable, firm grip that locks your workpieces in a desired position. 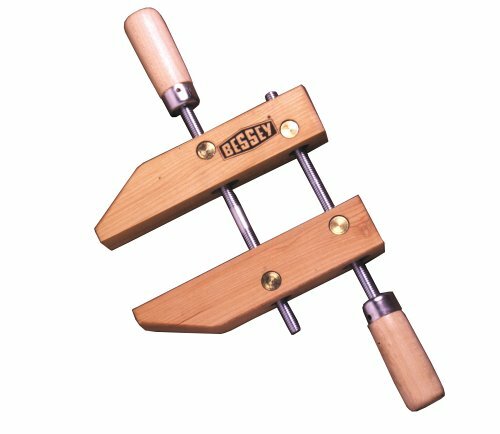 These classic hardwood accessories prevent workpiece slide and movement, thereby improving both critical user safety and enhanced woodworking accuracy. And they're rugged enough for hard stock but gentle enough for more delicate work material. Acme-thread technology feature makes clamping action Quick, easy and ultra-secure. Generous, large ergonomic handles insure the utmost in comfort, control and optimal clamping leverage. You can't go wrong with these versatile, must-have tools. Constructed of superior materials, these clamps are built for the ultimate in durability and efficacy. The clamp resists glue and won't Mar your work stock. The Spindle, swivel nuts, caps and hardware offer the ultimate in rust-resistance, dependability and stock-holding security. With their 6-inch jaw length, 3-inch clamping capacity and 3-inch throat, these devices adjust to accommodate to most stock size. These POWERTEC wooden clamps are essential for any professional or home workshop. Maximize outcomes and minimize hassle with these timeless Classics. We make the tools to support your creativity and productivity, so you can get the job done to perfection. 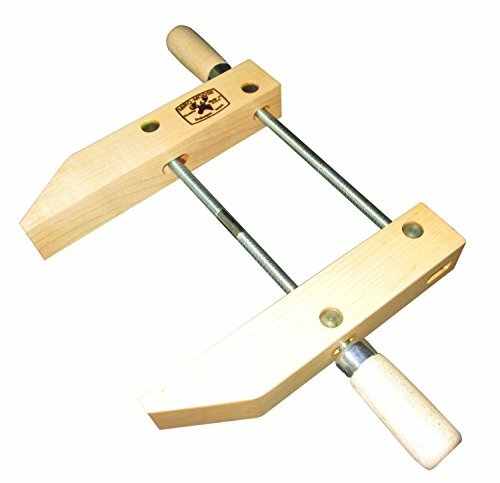 Jorgensen Handscrew Clamp, Adjustable, Style J, Jorgensen, 3 in Opening, 6 in Length, For Clamping Wood, Metal, Plastic and Other Material. Clamping width is 11.81 (300 mm). 8", Wood, Hand Screw Clamp, Large Diameter Spindles For Added Strength & Durability, Spindles & Swivel Nuts Are Made From Cold Drawn, Carbon Steel, Acme Thread For Rapid Operation & Years Of Hard Use, Hardwood Handles Are Over-Sized For Comfort, Extra Torque & Reinforced With Steel Ferrules, The Spiral Pin Used To Secure The Handles To The Spindle Is Easy To Remove For Repair Or Replacement, Metal Parts Are Treated To Resist Rust, Jaws Made From Quality Hard Maple For A Lifetime Of Use Are Oiled To Resist Glue, 8" Jaw Length, 5" Clamping Capacity, 4" Throat Depth, .44 Spindle Diameter. Jorgensen 8-1/2in. 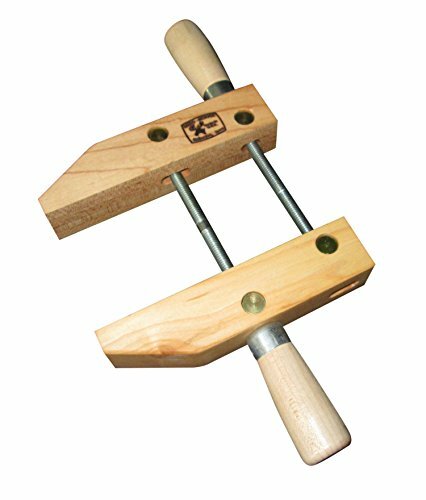 Handscrew Wood Clamp. 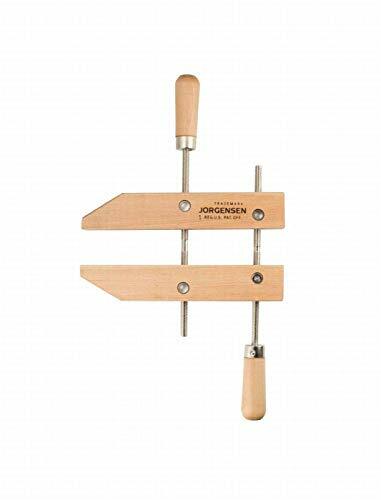 Every Jorgensen handscrew we make is crafted to ensure maximum strength and durability. 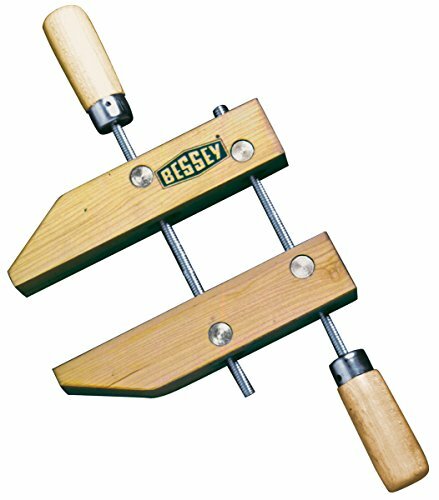 Seasoned, straight-grain hard maple wood jaws marry with cold-drawn steel spindles and nuts with special double-lead threads. 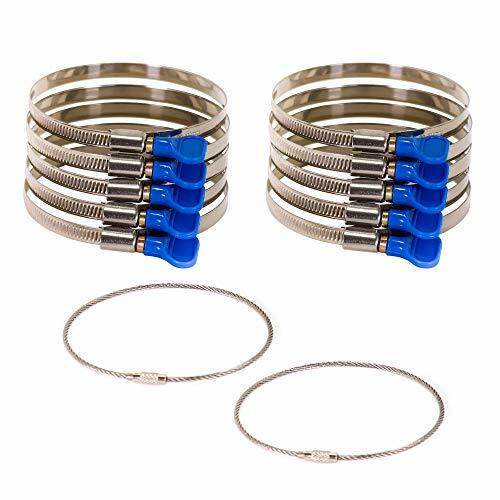 Together they create a handscrew clamp that holds tightly over broad areas, providing greater reach and a wider distribution of pressure than other clamps. The angle between the jaws can be adjusted to fit the work, allowing them to hold odd shapes easily. Our handscrew clamps are easy to apply and remove quickly, and provide protection against marring of finished surfaces. Traditional seasoned hardwood handles are designed for comfort now and for years to come. 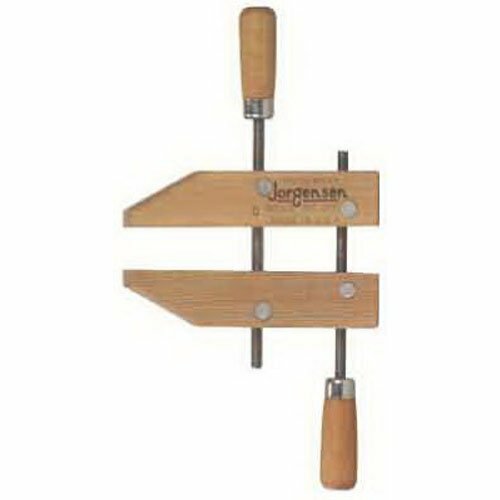 The Jorgensen Size 2 8-1/2-Inch Handscrews Wood Clamp is a great solution for your gluing and assembling needs. 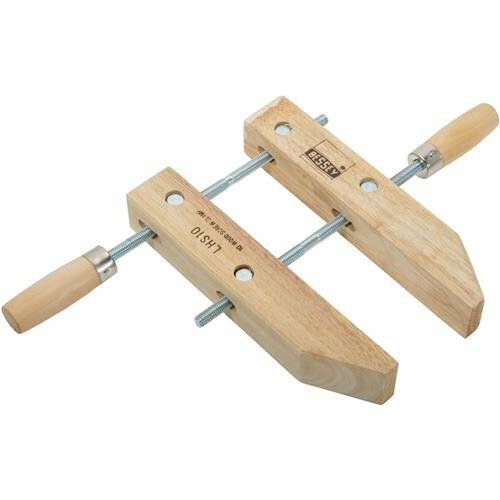 The hard seasoned maple jaws won't slip and won't damage your work, and they can be adjusted to give you either a powerful or a delicate grip. 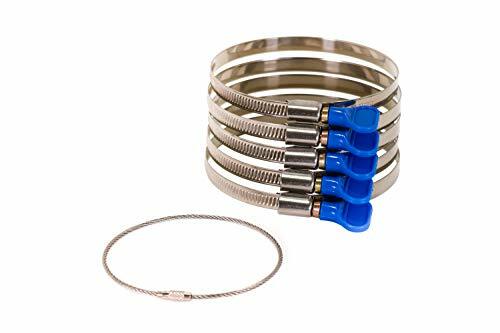 The handles are designed to keep your hands comfortable, while the spindles and nuts are machined with special double-lead threads for strength, durability, and quick adjustments. This clamp is backed by a 1-year limited warranty. Each pack contains two additional and handy key chains, so that you can keep your clamps together and organized. 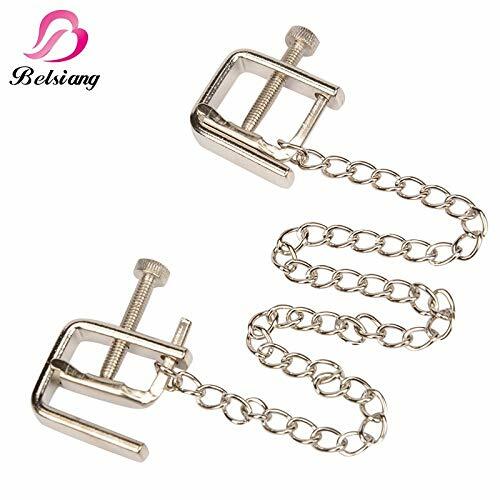 Use the chains to hang them from a peg or to carry them easily. Thank you for purchasing Interesting store massagers,Our motivation comes from your satisfaction! Made with safe silicon and ABS,the Interesting store massager is designed to provide a feeling unlike anything you`ve experienced. Use it by yourself, or give it as a gift. Click"Add to Cart" NOW to experience pleasure the Interesting store massager bought to you. Shipped fast and totally discreet - Now go for it! All Raymond I products come with 24-month 100% money-back guarantee. If you have any problems with this massager, you can just contact us for a solution. Keep the item in a dry and safe place away from children. Powerful Can be used for beginners or for those who need a more powerful toy. Simple and unique. Easy to operate. A variety of functions can be adjusted to suit a variety of massage needs and relax. If you like this article, add it to the cart and to the collection, if you have questions and more information, as well as the shipping problem, consult the service staff. Perfect for just about any size. Use it anywhere and anytime. 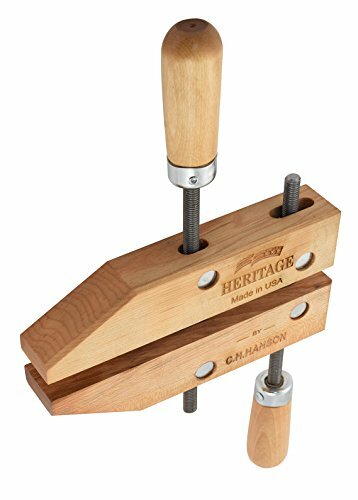 Responding to craftsmen s and builders desire for American-built quality, hand tool manufacturer C.H. Hanson has announced it is now offering new lines of Heritage wood screw and metal spring A clamps that are sourced and manufactured in North America. U.S. workers at C.H. Hanson s suburban Chicago headquarters will build the Heritage products.